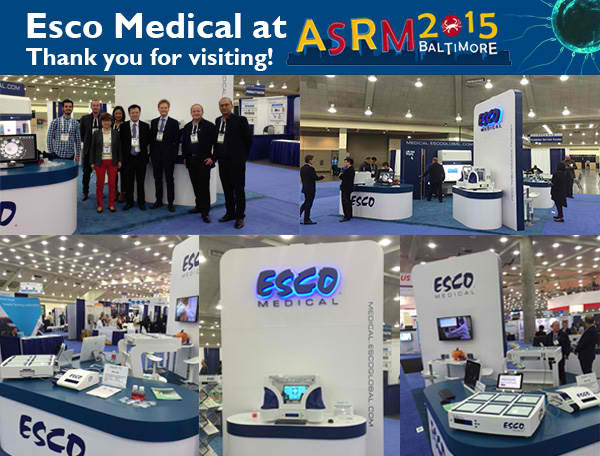 ASRM, held on October 17-21 at Baltimore Convention Center, Maryland, USA, is indeed a very successful and enjoyable experience for Esco Medical. We are truly grateful for those who visited us and showed interest in our products. We are also grateful to our existing users, our loyal customers, who also paid a visit to see our newest product, Semi Closed Environment (SCE) for ICSI and IVF, to learn how it can help them in their everyday routine. Miri® Multi-room Benchtop Incubator, Miri® TL Time Lapse Embryo Incubator, Fertilisafe™ Multi-zone IVF Workstation, Miri® GA Gas and Temperature Validation Unit, and Miri® GA Mini Gas Validation Unit are also presented in the booth. We have received overwhelming positive responses and inputs that will guide us as we develop some more advanced innovative technologies for the IVF industry. With the responses and support that we get from our clients around the world, Esco Medical is becoming more committed and determined to work even harder and provide the IVF industry with top-of-the-line products that will address its ever growing requirements and demands. On behalf of the Esco Medical Team, we hope that you enjoyed this year’s ASRM as much as we did. We wish that our products have given new hopes and inspiration as we work together in one goal – increasing pregnancy success rates and fulfilling every couple’s dream.